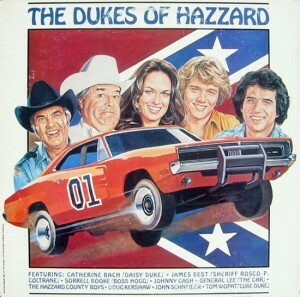 But Daisy, Bo and Luke Duke were more than just hunky characters on the TV show The Dukes of Hazzard from 1979 through 1985, they were champions of community, social justice, civil liberties and simple living. I can still hear Waylon Jennings crooning about the good ole’ boys “fightin’ the system like a true, modern-day Robin Hood,” as the General Lee leaps a barn and flies off into the wild, blue yonder of freedom. Sure, Bo and Luke ran moonshine in a Dodge Charger done up six ways to Dixie while Uncle Jesse supplied a tri-county area with white lightning, but who doesn’t jerk some hooch on the side these days? The times are hard, are they not? While being emphatically over the top, the Dukes represented some of the best elements of the dying South. Family was a loosely flowing concept able to incorporate even the craziest cooter. And that family always stood up for what Jesus would have called the least, lost, last and loser, even in the face of an unjust law. When the man tried to get them down, Bo and Luke rose up like true outlaw heros, ready to defend the name of chivalry via fisticuffs and dynamite-tipped arrows. When society at large was being tempted to walk the broad path, the Dukes always chose the narrow (windy, country) road.